All are invited to the WVIC Eid festivities. Join us for good company, food, and fun activities for the children. When - 6:30 PM, July 6, 2016. Fee - $20 per adult (above 12 years of age). $10 per child (5 to 12 years of age). Children under 5 years of age are free. Please join us on Saturday, June 25, 2016, at 7:30 PM for our annual fundraiser iftar at Hilton Garden Inn - Avondale. Please RSVP so we can make proper accommodations. 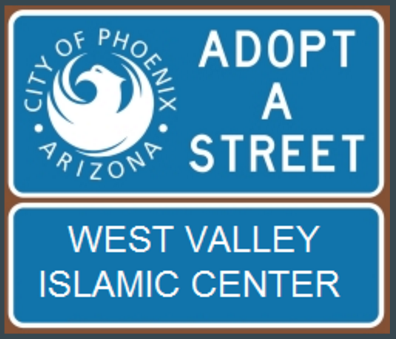 Join us in cleaning our adopted street, Thomas Rd between 91st and 99th Ave, in front of Banner Estrella Medical Center. Great community service opportunity for adults and children. Meet us at our makeshift command post in the parking lot next to McDonalds on the corner of Thomas Rd and 91st Ave.